Run, run, as fast as you can! You can't catch me, I'm the Gingerbread Man. 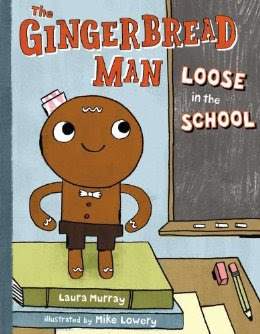 That is how the original story of the Gingerbread Man goes but in the new book from Laura Murray, the Gingerbread Man is actually loose in the school and trying to catch up to the kids at recess after they forgot him in the classroom. This is such a fun book with a new twist on the Gingerbread Man story! Please head over to The Little Crooked Cottage to see an exclusive interview with the Gingerbread Man - and find out if he does have a belly button - and see my lunch there! This is so cute. I love this book too. It is a favorite of mine. I will be pinning it to my Read.Explore.Learn. board. So cute! My daughter's kindergarten class just did a week of the Gingerbread Man's antics -- I may need to make a version of this for her lunch this week!